Subsidiary dam, Musjid Basin, when being closed [Victoria Dock construction, Bombay]. bl.uk > Online Gallery Home	> Online exhibitions	> Asia, Pacific and Africa Collections	> Subsidiary dam, Musjid Basin, when being closed [Victoria Dock construction, Bombay]. 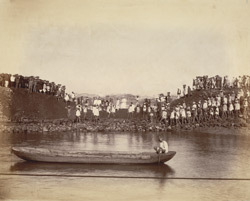 A photograph by E Taurines of the Musjid subsidiary dam of the Victoria Dock in Bombay City taken between 1885 and 1888. The Musjid and Nicol basins were absorbed into the new scheme for the extension of the Prince's Dock, which later came to be called Victoria Dock. The subsidiary dams made at these basins were completed in 1886. The excavation and masonry work was undertaken by Messrs Kirby and Co. The Musjid Bunder Storm drain, which discharged into the harbour, had been made to flow into the Stand Road drain by reversing the gradient and the sill raised with rubble and lime masonry.